Provo will join South Jordan in having 2 Mormon temples. Provo • Not only will the LDS Church save the fire-gutted Provo Tabernacle, but it will exalt it as well. Church President Thomas S. Monson announced Saturday that the Salt Lake City-based faith will fully restore the exterior of the 128-year-old building and convert it into Utah's 16th Mormon temple  raising it from the ashes as the legendary Phoenix did. Monson said the tabernacle-turned-temple will relieve strain on Provo's existing hillside LDS temple, which he described as one of the busiest in the worldwide church. When the Provo project is completed, that city will join South Jordan as the only cities in the world to sport two LDS temples. Saturday's announcement was greeted with an audible gasp from many in the Conference Center's 21,000-person audience in downtown Salt Lake City and with joy on the streets of Provo, where people flocked to the site. "It is a historical thing," said Denny Brown, who came as soon as the news broke. "I can tell my grandchildren I was No. 1 to see my new temple." Others quickly followed, streaming into the heart of Provo to take pictures and soak in the experience. Orem resident Kay Davenport came down with Inori Uryu, a missionary assigned to Provo, to get a picture of the Japanese missionary in front of the tabernacle, its brick walls swaddled in heavy steel girders since the devastating Dec. 17 fire. "We're so happy," Davenport exclaimed. "We are going to have two temples in the city." 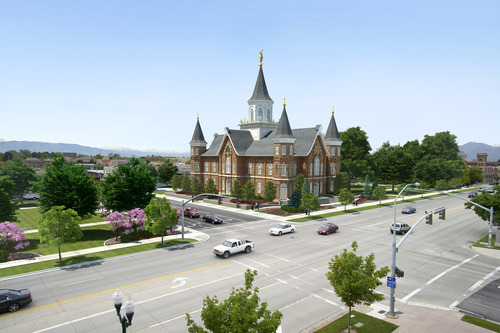 Provo's twin temples will give Utah County four such edifices  with a temple groundbreaking set for Oct. 8 in Payson. There also is an LDS temple in American Fork. Salt Lake County has four Mormon temples as well. Church leaders previously announced plans to build a fifth, but that location has yet to be named. The new Provo temple will mark the second time the church has transformed a tabernacle into a temple. It did so with the Uintah Tabernacle in Vernal. In recent weeks, the church has been buying property south of the Provo Tabernacle to provide "options" for its plans. Angela Decker, a Brigham Young University student from West Jordan, said she "squealed" at Saturday's news. 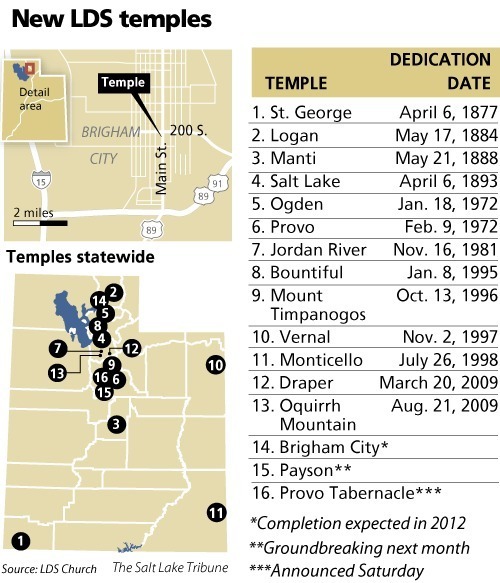 "I'm from Utah, so I never squeal at the announcement of a new temple," Decker said, "but this is the second city with two temples." Preservationists in Provo have been urging the LDS Church to restore the tabernacle ever since last year's fire. One of them was L. Douglas Smoot, who spearheaded the restoration of Academy Square, which then became Provo's showcase city library. "It was my great-grandfather, Abraham Owen Smoot, who was responsible for building that [tabernacle]," Smoot said. "He was the stake president at the time, and it was a very emotional thing [to hear the announcement]." Church renderings released Saturday show that the restored building will include a spire in the middle  a feature included in the original structure but removed nearly a century ago. Provo Councilwoman Sherrie Hall Everett recalled the bitter emotions she experienced when the tabernacle burned, but is overjoyed that it will become a temple. Everett said she has many fond memories of the building, having performed there with choirs. "I've had great testimony moments in that building," she said. Everett said she had a sense that the fire would not end the building's story. She said the fact that a picture of Jesus survived the flames was a sign of hope  as was the church's commitment to bracing the walls after the blaze. Provo Mayor John R. Curtis recalled that, after the fire, church officials assured him they were sensitive to the place the tabernacle occupied in people's hearts. "It will be fabulous on so many levels," Curtis said. "It will revitalize downtown and it will ensure the history and legacy [of the tabernacle] will live on." He said the temple plan represents another significant downtown investment. The city and Utah County are working together to build a convention center  due to open in the spring  and Nu Skin Enterprises is expanding its headquarters on Center Street. Bill Hulterstrom, United Way of Utah County's executive director, said Saturday's development was a good omen for Provo. "In downtown, things are on a rebound," Hulterstrom said. "The temple enhances the image of downtown as a destination." Temples are where faithful Mormons participate in the highest sacraments of their faith, including eternal marriage.